Fund manager Jim Chanos spoke to Bloomberg TV’s Carol Massar about China's economy, debt and real estate market. 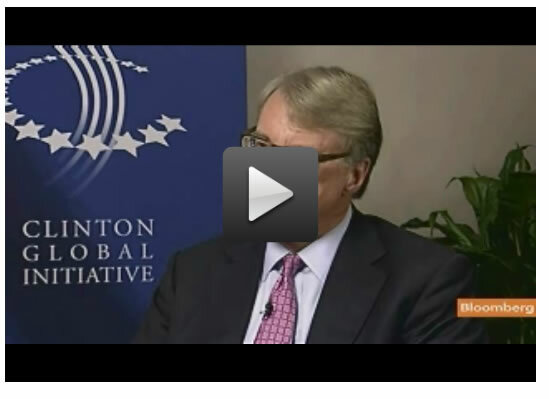 Chanos said that growth in China may be zero and that China has “European kind of numbers” when it comes to debt. "I think that will be the surprise going into this year, and into 2012 - that it is not so strong. The property market is hitting the wall right now and things are decelerating. The CEO of Komatsu said last week that he is having trouble getting paid for his excavator sales in China. Developers are being squeezed. They're turning to the black market for lending, this shadow banking system that is growing by leaps and bounds like everything in China. "Regulators over there are really trying to get their hands around the problem. In the meantime, local governments have every incentive to just keep the game going. So they will continue with these projects, continuing to borrow as the central government tries to rein it in." "We are short Chinese banks, the property developers, commodity companies that sell into China, anything related to property there is still a short." "We are long the Macau casinos. It's our long corruption, short property play. We feel that there's American management and American accounting. They are growing at a faster rate even than the property developers." "A lot of people are assuming that half of all new loans in China are going to go bad. In fact, the Chinese government even said that last year relating to the local governments. If we assume that China will grow total credit this year between 30% to 40% of GDP, and half of that debt will go bad, that is 15% to 20%. Say the recoveries on that are 50%. That means that China, on an after write off basis, may not be growing at all. It may be having to simply write off some of this stuff in the future so its 9% growth may be zero." China’s stocks rose, sending the benchmark index to its biggest gain in four weeks, after a gauge of economic indicators signaled growth is withstanding Europe’s debt crisis and faltering expansion in the U.S. The IMF estimates the Chinese economy will grow 9.5 percent this year, down from a forecast of 9.6 percent in June, and 9 percent in 2012. The fund lowered its estimate for world growth this year to 4 percent from the previous 4.3 percent forecast. Developers not getting paid, coupled with excessive and unsustainable credit growth, trumps alleged leading indicators. For another view on the coming slowdown in China, please consider Michael Pettis: Long-Term Outlook for China, Europe, and the World; 12 Global Predictions. Pettis, unlike Chanos does not foresee a China "crash" but at a minimum, those expecting huge growth certainly will not get it. Here are 12 predictions by Pettis (Please see article for detailed explanations regarding China). In the face of coming writedowns, alleged "cheap" valuations will likely get much cheaper. As Minyanville's Peter Atwater is fond of saying "At the top of every credit cycle, the Income Statement is the Past, the Balance Sheet is the Future"
Atwater's statement applied to "financial institutions", but Ponzi financing is everywhere you look in China and the ripple effect will hit every company just as happened in the US credit bust (soon to be resumed).